Bindhani Wedding Bridal Indian Head Jewelry Maang Tikka Mang Tika Earrings Set For Women by Bindhani at SCRHI. MPN: SHACCE00108_US. Hurry! Limited time offer. Offer valid only while supplies last. One of the most favourite pieces of jewellery at wedding functions or formal events is the maang tikka, also known as maatha patti in some areas. 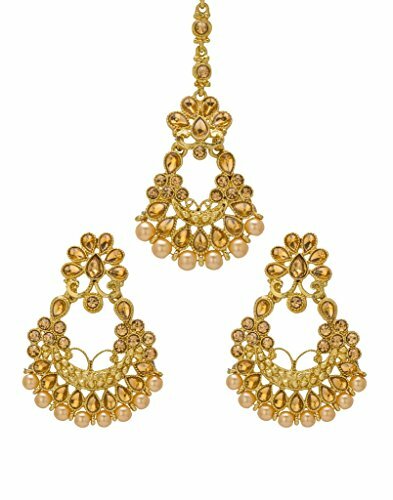 This Indian Pakistani Head Jewelry with Earrings Can be worn for engagement and wedding parties, And go with ethnic or traditional out fit. Easy to wear and put on. .Imitation Pearl,Kundan and Diamond Stone . If you have any questions about this product by Bindhani, contact us by completing and submitting the form below. If you are looking for a specif part number, please include it with your message.